During the construction of a new Vienna city district (Aspern Seestadt) a mobility guidebook including various mobility management measures was developed by a large number of stakeholders. The aim is to achieve a modal share of 30% motorised traffic. Vienna is developing a new city district: Aspern Seestadt - construction of which is planned to start in 2009, the first inhabitants will come in 2012. In 2025 the new district is to have 20.000 inhabitants and 20.000 jobs. The distance from the city centre is over 10 km, however, it will be connected to the city centre by underground from 2014 on. A Masterplan of the city was made in a concourse. 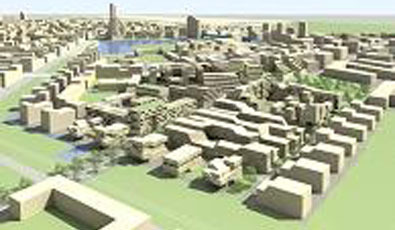 The Masterplan was accepted in 2006 by the Vienna city government. It contains the aim to have a modal share of only 30% motorised traffic. There are policies like the Master Plan Traffic Vienna 2003, that encourage the developer to consider Mobility Management, however, there are no provisions contained in the Masterplan. To close this gap, the consultant encharged was commissioned to develop a mobility guidebook in an interactive process with many stakeholders, including city planners, traffic planners, politicians and public transport companies. The developed mobility guidebook provides detailed guidance for the Aspern Seestadt development company on how to proceed during the coming years to achieve the high level goal of less than 30% motorised traffic. The process of developing the mobility guidebook through a series of workshops has resulted in broad support by all major stakeholders for very innovative mobility management and general sustainable transport measures. The workshops were conducted according to the methodology used within the MAX research project. This resulted in a joint development of for Vienna totally new measures. Detailed information on how to organise transport will be available for potential new inhabitants. At time of move-in, inhabitants will receive a Mobility Guidebook with all information on walking, cycling and Public Transport. With money of a “Mobility Fund”, all inhabitants will receive a PT-ticket for a period of at least one year to generate sustainable transport behaviour from the first moment. The sort of strategy - putting mobility issues central - could even have been implemented in an earlier stage in the project - in that case the master plan might have looked quite different, the goals could have been even more ambitious.